These days, California’s renewable energy records are regularly broken. 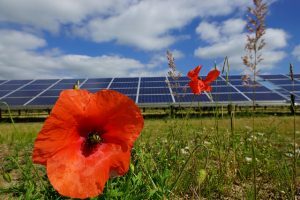 During the summer solstice on June 21, California utility scale solar power set a generation record with solar producing equivalent to about 16 percent of all electricity consumed during the day. And earlier this year, on April 27, California set two renewable energy records for both instantaneous solar generation: about 10.5 gigawatts), and instantaneous renewable generation: 73 percent of the state’s total electricity demand came from renewable energy. With renewables deployment poised for more growth, it’s likely even these new records will be surpassed sometime soon. However, to ensure the state’s investment in clean energy is put to use, and not wasted, California has some work to do. As demonstrated by the recent generation records, California’s ambitious climate and energy goals are helping add incredible amounts of wind and solar. Fortunately and unfortunately, these renewable resources produce a lot of electricity in the middle of the day and at night, but not in the late afternoon or early evening when most of the population comes home from work. When combined with other factors, this mismatch causes energy system imbalance. To maintain balance, grid managers purposefully, and increasingly, turn off (curtail) renewable energy power plants, even though those plants are otherwise operational. Curtailing renewable energy wastes the opportunity to utilize the sun and wind energy that is provided by nature at no cost. This approach to managing renewables can make it more expensive for California to meet its clean energy and climate goals. Furthermore, additional investment in renewable energy can be hindered as would-be investors expect lower returns from facilities that may not run at full capacity. About 60 percent of the time, curtailment in California is the result of excess generation – where the supply of electricity is more than demand. This typically happens during the middle of the day and at night when there is generally lower energy demand but significant solar and wind, respectively. As the state progresses towards meeting goals of 50 percent renewable energy and higher, and as more rooftop solar is added, excess generation is expected to happen more intensely and more regularly. About 60 percent of the time, curtailment in California is the result of excess generation. To put the wasted renewable energy in perspective, conservative estimates show that curtailment of wind and solar doubled from 2015 to 2017 – with enough wasted energy to power about 56,000 California homes for a year. While the state’s extra hydro power exacerbated curtailment in 2017, utility-scale and rooftop solar were the key driver behind the rapid growth of curtailment during this time period. 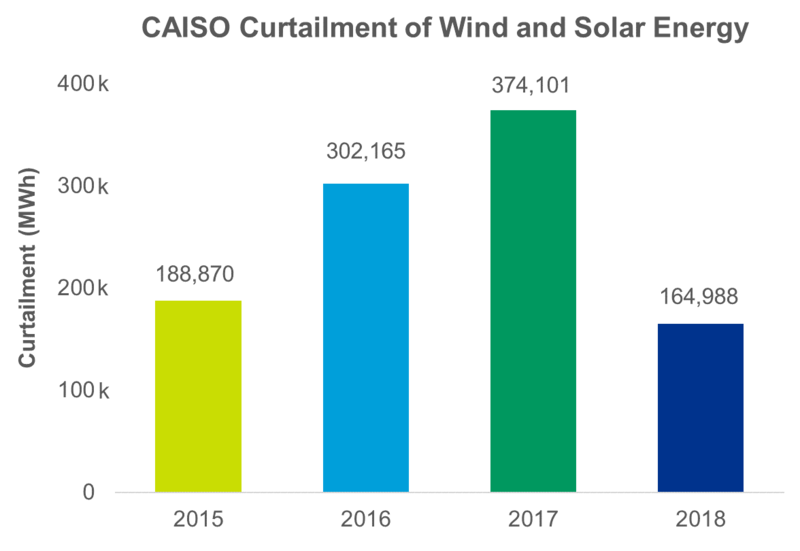 To further contextualize the curtailment problem, in 2017 renewable curtailment occurred in about 38 percent of hours, with an average of 1.4 percent of the total wind and solar energy online in a given hour being curtailed. In some hours, more than 10 percent was shut-down. When considered through an investor’s point of view, that’s a 1.4 percent reduction on investment return, simply because we don’t have systems in place to put that clean energy to work. And again, this is likely to get worse unless California works proactively now. For California to meet the energy demands of tomorrow with increasing heat waves, a ballooning population, and more devices using electricity, a portfolio of solutions is needed. Solutions that change energy consumption patterns, improve efficiency, store energy, improve forecasting of usage patterns, and allow for more flexible operation of power plants are all necessary. Included in this portfolio are both the expansion and creation of new opportunities through a cost-saving regional electricity grid. Linking with other regional energy markets could give California an opportunity to export excess clean energy to our neighbors – rather than shutting it off. Linking with other regional energy markets could give California an opportunity to export excess clean energy to our neighbors – rather than shutting it off. In return, a regionalized grid allows California to import clean energy resources from other states instead of burning fossil fuels like natural gas in the evening and at night. As an example of the benefits of a regional grid on curtailment, California is already doing some energy trading on a small scale with its Energy Imbalance Market (EIM). Since 2015, the EIM has avoided about 587,000 megawatt hours of curtailment and displaced about 250,000 tons of CO2. A regionalized grid, such as that proposed within Assembly Bill AB 813, could supercharge the effort to utilize our renewable resources and help make California’s wasted energy problem a thing of the past. By doing so, regionalization can also substantially reduce procurement costs, and greenhouse gas emissions as well. With strategies and tools like regionalization, California’s utilities, policymakers, and regulators can and should be acting to create a more flexible electricity system and to reduce the amount of clean resources we curtail. As we move toward a cleaner electricity system, we shouldn’t be letting our resources go to waste. For more information on the benefits of a regionalized energy grid, read here and here. This entry was posted in California, Clean Energy, Regional Grid, Solar Energy, Wind Energy. Bookmark the permalink. Both comments and trackbacks are currently closed.